Now that the weather is cooler, I can turn to soup. Soup is so nice. Comforting. Tasty. 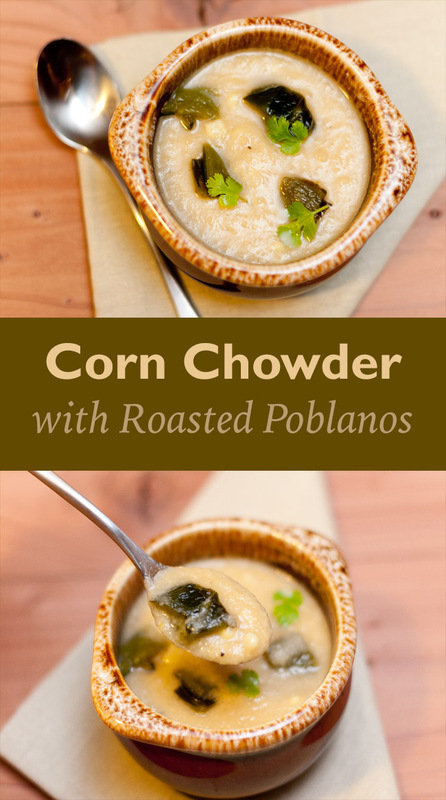 Vegan Corn Chowder with Roasted Poblanos. Next time I make this soup, I’ll chop the chiles into smaller chunks. But, it was still really tasty! This was a great tasting vegan soup that’s also gluten-free. So many soups have a gluten based thickener. This one’s thickness comes from the pureed onion and corn. Tasty and healthy! This is also nice because the onions and poblanos are roasted in the oven, leaving you lots of time to work on other things. Poblanos are a fresh large green chile that are sometimes called pasillas. They look a lot like a sweet green pepper. Poblanos have a mild spiciness to them, and roasting them brings out their sweetness. You could make this soup a little heartier by adding green onion, potatoes, and sautéed tofu chunks. And, of course, I’d love it topped with avocado slices. Place quartered onion and garlic clove on a large sheet of foil. Drizzle with oil, and sprinkle with salt. Bring corners of foil up over onion to make a packet. Place foil packet on a baking sheet or large cast iron skillet, and place chiles next to foil packet on the baking sheet. Roast onion packet and chiles for 15 minutes, or until chiles look soft and are starting to char. Using a pair of tongs, flip chiles over, and return to the oven for another 5-10 minutes, or until they are uniformly softened and charred. Remove chiles from oven, place on a plate, and set aside to cool. Return onion packet to the oven to continue to roast another 30-40 minutes (about an hour total). Onion will look slightly golden and very soft when done. Peel cooled chiles under running tap water. Remove stems and seeds from chiles, and chop into small pieces, about ¼ to ½-inch. Set aside. Once onion and garlic have finished roasting, place onion, garlic, and any juices that have accumulated in the foil in the bowl of a blender. Add half of the thawed corn, and 1 cup of broth to the blender. Puree until smooth. Pour pureed corn mixture into a medium pan, and heat over medium-high heat. Add remaining corn, 1 cup broth, and chopped poblanos, and simmer until heated through. Taste and season with salt and pepper as needed. Ladle chowder into bowls, and sprinkle with chopped cilantro. what a fabulous combination of flavors. this looks delicious! This looks really yummy and something I am really looking forward to trying out! Thanks for the recipe. all i want to do lately is eat soup and baguettes and i’m looking forward to trying this one out. thanks! This looks amazing!! Now that it’s finally getting cooler, all I want to make is soup!! I’ve been on the hunt for poblano peppers!! Do you live in Orange County? It looks like on your fb page that you’re from Orange. Where do you get poblano peppers? And, if you have a Mexican market near you (look on Google maps for Mexican market), I bet they’ll carry poblanos as long as they have a produce section. I live in Buena Park (by Knott’s), but I’ve only tried Henry’s and Whole Foods but couldn’t find them. I’ll try to hit up a Northgate, they’ll probably have them 🙂 thanks!! Hi Debi, this looks really tasty! Thanks so much for sharing this recipe with Sunday Night Soup Night. I’ll be hosting weekly through fall and winter, so I’d love to see you again with your next soup/stock/chowder recipe! I think I need to make this. Stat.